View Poll Results: Carbon fiber connecting rods? Carbon fiber rods that weigh 250 grams yielding a bob weight of about 1075 grams: Would these products be of interest to anybody? Last edited by CFMTEF; 11-05-2018 at 02:21 PM. That's super light. What durability testing has been done on them to date? Of course this was 40 years ago, and perhaps carbon tech has evolved. I’m just sharing an honest real life example of CF rods failing. None; hoping soon to start developing them and am curious as to how many folks may be interested. 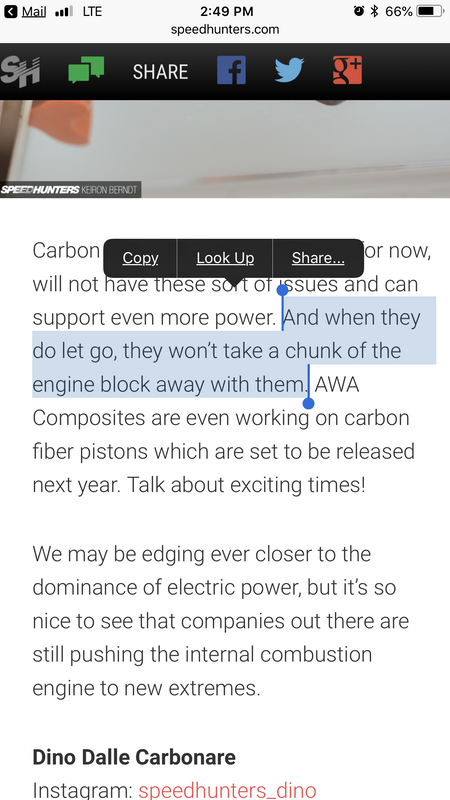 Fellas, if carbon were to work in this application, one major advantage would be if it were to break, it kinda of shatters so it will likely not damage the rest of the engine. Think of them as a fuse. they would not bend either. This would really be cool if the price wasnt absurd. I'll be a tester in my turbo 5.3 if you want to send me some. i'll put them through their paces. Too late bud. Carbon Fiber rods are already out and are competitively priced at just $18,000 a set. Disagree unless they have carbon fiber pistons lol. If the rod is the fuse and let's go it means the piston will be free to hit the head or crank and do more damage. competitively priced at just $18,000 a set. LMAO!!! Technically they should not cost much more than a good set of billet Steel rods. You can make a "forging" from a clamshell tool that just needs some final machining (hopefully you can make them good enough to just need honing) after de'mold. Are you making them in a clave or a press? CF rods would be very nice but the price point would have to be $1,500 or less for a set for a lot of us. The crowd funding is closed for Naimo but it's an interesting read. Reminds of when no one made long tube headers for swapping an LS1 into a 3rd Gen fbody. A dozen of us donated $200 each to a local shop that's business focus was 3rdGen f-body's ​​​​​to fab up a set and do a production run of 12 sets. The $200 would count towards purchase of a set of headers. About 18 months later Stainless Steel Works had the prototype set completed and was ready for production. Of course the shop was flirting with bankruptcy at this point and couldn't pay SSW to make the headers. The shop owner was full of lame excuses to the point I called SSW myself to find out the reason for the delays. ​​​​​​The shop owner was at a lose for words and held his head low at various car shows. Soon shop was out of business and thankfully Hawk's Motorsports stepped up and acquired the swap header rights / design. Hawk's got the product to market and it sold well. Of course none of the original dozen got headers or their $200 back from the other shop. I suspect the route to crowd funded carbon fiber connecting rods might be more difficult than getting a set of LT/mid length LS swap headers created way back in the early 2000's. They'll be made in a press with unidirectional tape, laid up by hand and the goal is to sell them for less than titanium sets. Yes I know, just a great statement you made! I would be curious to see how they would do compared to an aluminum rod, id be willing to try some myself if the price was competitive with other high end off the shelf connecting rods.